Now that we have planned all of the enemy paths, and we have planned and canceled the Missions for all our hierarchies, we are building and refining our Faction AI Script. At its heart, a Faction AI script is just a list of triggers, or conditions that must be met, and orders to be executed upon those triggers. 1. The 'AI Phase Order' consists of a series of conditions and a series of orders, executed when the conditions are true. Each order in the AI Phase Order is a Hierarchy Order, consisting of a single order-hierarchy pair. The order is the instruction to be given and the hierarchy is the target for the order. 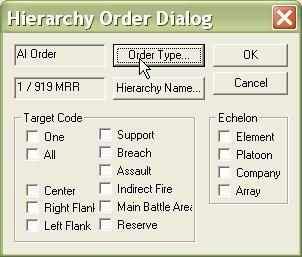 We are going to change the order for this Hierarchy Order to a 'Cancel Toggle Order'. 2. We select 'Cancel Toggle Order' from the list. This will turn OFF the Orders or SOP's we select. 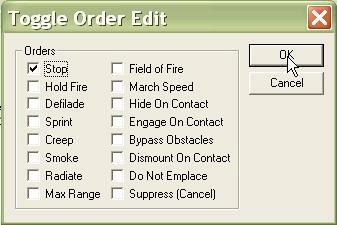 If we wanted to turn ON Orders or SOP's, we would select 'Toggle Order' instead. 3. Select the Orders and SOP's you want to turn off. 'Suppress' can only be turned off. Selecting it with a Toggle Order has no effect. 'Field of Fire' and 'Max Range' can only be turned on with a Toggle Order if they have previously been set for each unit in the hierarchy. 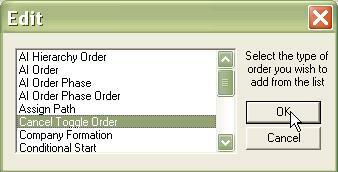 Any unit that has never had this order set will not respond to the Toggle Order request. 3. NOT COMMONLY USED. You will be prompted to add Data References. If we want the hierarchy order to use any of the 'Prerequisite Data' items from the initial AI Order dialog, we specify them here. The only data item that would be useful here is the 'Specified Force' data item, which would allow you to change the target for the order. But it is not really THAT useful, as the hierarchy order already lets you set a target.